BDN Exclusive - Like Caesar’s Gaul, all ACC basketball seasons are divided into three parts. At least that’s the way Duke coach Mike Krzyzewski approaches the basketball year. He divides each season into (1) the non-conference “pre-season”; (2) the conference season; and (3) postseason. Of course, there’s not always a fine dividing line before the first two parts of that equation. This season, for instance, Duke will open conference play Sunday night against Clemson – but the Blue Devils will still have three more non-conference games on the regular season schedule. And while the ACC as a whole dives into conference play a week from Saturday, there have already been a handful of league games. Still, the three-part division of the season makes a lot of sense. The league’s six-week “pre-season” is coming to an end and it should give us a better idea of how the league is going to shape up this season. Let’s go back to the beginning. At ACC Operation Basketball late in October the league’s media members got together and tried to rate the conference this season. For the first time in history, the vote for first place was dead even – both Duke and UNC wound up with 545 points. The rest of the standings sorted out as Clemson in third, followed closely by Georgia Tech and Maryland. There was a fairly substantial gap in the voting after the Terps – but just one point separated sixth place Wake Forest and seventh-place Florida State. Virginia Tech and Boston College were just a little further back. Then there was another gap and before the final three: No. 10 Miami, No. 11 Virginia and No. 12 N.C. State. To me, the most interesting part of the vote was not the tie at the top, but the race for third place. You see, over the summer, I had to provide an ACC ranking for the Blue Ribbon Basketball Yearbook. Finding it impossible to sort my own feelings out, I consulted with almost a dozen other writers I respect. To my dismay, they were as confused as I was. Everybody agreed that Duke and UNC were the two favorites and that Miami, Virginia and N.C. State (in some order) were the league’s three also-rans. But that was the extent of the agreement. I got votes for seven different teams in third place (Clemson, FSU, Georgia Tech, Maryland, Virginia Tech and Wake Forest) and saw those teams ranked in almost every imaginable order. Well, going into the new year, the 12 ACC teams have played an average of almost 12 games each. Shouldn’t it be easy to re-rank the league with some semblance of confidence? But what are we to think when we see Wake Forest lose at home to William & Mary ... then go on the road and beat Gonzaga in Spokane? Or when N.C. State loses at home to a Northwestern team playing without its best player ... then goes to Milwaukee and knocks off Marquette? We have Boston College upsetting Michigan in Ann Arbor, returning home to edge Miami in the ACC opener ... then losing at home to Harvard for the second straight year. And what are we to think about Clemson? One moment, the Tigers are building a 23-point second half lead on Illinois ... a lead Clemson manages to squander in barely six minutes before losing in Littlejohn to the Big Ten visitor. Making the picture even more confused, several teams have had to play without key players. Duke fans know how much the early season wrist injury that sidelined freshman center Mason Plumlee has delayed his development. But Boston College had to play a month without Rakim Sanders, the Eagles’ best player. Maryland played its early schedule without projected starter Dino Gregory. Georgia Tech has been without budding star Iman Shumpert. N.C. State has had to deal with injuries (Richard Howell) and suspension (Farnold Degand). Veteran guard Marcus Ginyard has been in and out of UNC’s lineup. Krzyzewski offered a warning to those who would try to read too much into the early season results. After Duke’s pre-Christmas victory over St. John’s, a reporter asked him about his visible efforts to pump up an uninspired Cameron crowd. If Duke – with one of the most experienced core groups in the ACC – is “developing”, what about Georgia Tech, trying to work four freshmen into the rotation? What about UNC, trying to replace four starters off its national championship team? What about Florida State, trying to learn to play without Toney Douglas, or Boston College, trying to replace Tyrese Rice or Miami, trying to replace Jack McClinton? A LOT of ACC teams are still developing. As a result, it’s almost as difficult to rank the ACC going into the second third of the season as it was back in late October. Almost – but not quite. We have learned a lot – enough to make a better guess at how the league stacks up headed into league play. Here’s my personal ACC power rankings as of Dec. 31, 2009 (with an extended look at Duke). I include the date because the league is still sorting itself out and I reserve the right to change my mind when somebody gets hot in January or loses a key player in early February. 1. Duke (11-1). It seems hard to believe, but before the season, many outside observers thought that the team’s weakness would be its backcourt. Check out ESPN, The Magazine, which ranked the Devils No. 11 national – largely because of its questionable backcourt. If the first month and a half of the season has proven anything, it’s that Duke doesn’t have a problem in the backcourt. Every question mark facing the team in preseason has been answered in the positive. Can Jon Scheyer handle the point? Well, how do you like a 6.6-to-1 assist-turnover ratio (the all-time ACC record is 3.48 to 1)? Can Nolan Smith take the step up from erratic supporting player to become a consistent star? How does 17.4 points a game (up from 8.4) and a 2.4 assist-to-turnover ratio (up from 1.1 to 1 last year)? Can Andre Dawkins, who skipped his senior year of high school, provide enough depth as the team’s third guard? How does 9.8 points and a 2.5-to-1 assist to turnover ratio in 19 minutes a game sound? His 49 percent 3-point shooting doesn’t hurt either. One month into the season, Duke unquestionably has the best backcourt in the ACC and maybe the best in the nation. If the vote were taken today, Scheyer would be the ACC’s runway Player of the Year choice. Up front, the answers haven’t been as universally positive, but they haven’t been negative either. The five-man post rotation has been solid, especially with senior Brian Zoubek stepping up his game. And Lance Thomas, freed from the responsibility of defending bigger players in the post, has emerged as a defensive dynamo. Sophomore Miles Plumlee is still looking for consistency, but the progress he’s made since last year are amazing – he already has more points, more rebounds, more blocked shots, more assists and more steals than he had all last season. His younger brother Mason has been limited by his injury, but he’s shown flashes of his extraordinary passing skills and his shotblocking ability. And Ryan Kelly, supposed to be little more than a shooter, has also proven to be a deft interior passer and a shockingly good shotblocker – averaging just 12 minutes a game, he already has 13 blocked shots (10th in the ACC). Their strong play inside has freed Kyle Singler to roam the perimeter. So far, the 6-8 junior has played well, but he’s struggled with his shot. In a way, his early play resembles Gerald Henderson’s start to the 2008-09 season, when his offensive woes hid his strong all-around game. Singer is rebounding, defending and distributing the ball at a very high level. If his shooting comes around, he’ll make a run at the ACC player of the year award he was voted in preseason. Overall, Duke has emerged as the clear ACC favorite and a potential national contender. Long Beach State coach Don Monson -- who has also faced No. 2 Texas, No. 3 Kentucky, No. 6 West Virginia, plus UCLA, Notre Dame, Utah State and the Wisconsin-Green Bay team that beat the Wisconsin team that beat Duke – declined to rate the Blue Devils against the other top 10 contenders. If Duke is going to win it all, the Blue Devils need to hold on to their obvious strengths – that superb three-man backcourt; that excellent interior depth; the strong overall defense – while improving in just a few areas – Singler needs to find his shooting touch and Mason Plumlee needs to become the pre-injury player who had 18 points and 13 rebounds in Duke’s first exhibition. 2. North Carolina (11-3) – It was ridiculous to rank UNC No. 4 in the AP’s preseason poll. This team bears little resemblance to last season’s national champs. At the same time, it would be absurd for Tar Heel haters to dismiss this team because Coach Roy Williams has struggled to blend a talented group of young and inexperienced players into a team good enough to cope with top 10 teams such as Texas and Kentucky (on the road) and Syracuse (in New York City). It’s a difficult struggle – Williams has admitted that’s been more negative with this team than any other at Carolina. At the same time, he notes that UNC is about in the same place they were in 2005-06, when another young team melded late and finished second in the ACC. The good news for Williams is that he’s gotten strong play from his veteran combo of senior center Deon Thompson and senior guard Marcus Ginyard. Sophomore point guard Larry Drew II hasn’t been great, but he’s been better than his lackluster freshman season would have suggested. And sophomore big man Tyler Zeller has really provided quality play off the bench. The bad news for Williams has been the lack of immediate production from his celebrated freshman class. Forward John Henson, who was projected as the No. 2 freshman entering the ACC (behind Georgia Tech’s Derrick Favors) has been a non-factor so far. Dexter Strickland showed signs of life in the Rutgers win – although Williams ripped him for taking (and hitting) the big shot in that game. Overall, he’s been far less effective than Duke’s Dawkins. The Wear twins have been marginal contributors and Leslie McDonald can barely get off the bench. That doesn’t mean they won’t eventually become quality players, but of the group, only Strickland appears to be on the verge of contributing. However, the biggest question mark for UNC has been the play of Ed Davis. The sophomore power forward would have been a lottery pick if he had declared for the draft last spring. His talent is such that he made first-team All-ACC in preseason after averaging 6.7 points and 6.6 rebounds as a reserve forward last season. Davis has stepped up his game, but he’s yet to become the monster that so many predicted. He’s averaging 14.7 ppg. and 9.9 rpg and ranks No. 3 in the ACC in blocked shots. That’s very good, but he hasn’t been dominating – yet. If UNC is going to challenge Duke in the ACC and make a run at national honors, Davis has got to take another step forward. Strickland and maybe Henson have to find their games. And most of all, UNC has to find some reliable 3-point shooting. 3. Clemson (12-2). Tough to rank the Tigers third after their collapse against Illinois and their close call last Tuesday night to South Carolina State. Still, almost all the rankings agree. Clemson is 21st in the AP poll and among ACC teams ranks second (ahead of UNC) in Pomeroy, third in Sagarin and fourth (behind FSU) in the RPI. Trevor Booker remains a beast inside and he’s getting help from his younger brother and from veteran Jerai Grant. Tanner Smith and Andre Young are helping veteran Demontez Stitt make up for the off-season loss of perimeter stars K.C. Rivers and Terrence Oglesby. The Tigers haven’t played the toughest schedule in the world, but they do have a one-point victory on a neutral court over No. 12 (at the time) Butler, plus wins over South Carolina and solid mid-majors Western Carolina and Long Beach State. Clemson – like UNC and Wake – was expected to have a problem finding 3-point shooting, but the Tigers currently rank third in the ACC in 3-pointers made and a solid sixth in 3-point percentage. They have the second best turnover margin in the league and lead the ACC by a wide margin in steals. If there’s been a disappointment, it’s been the play of McDonald’s All-American Milton Jennings, who might be the most celebrated recruit Purnell has ever landed. Like UNC’s Henson, he’s been a marginal factor so far. Oliver Purnell has established a baseline of solid performance at Clemson. His teams play good defense and get good shots (second in the ACC in field goal percentage). Now if he could just get them to shoot free throws – the Tigers currently rank 11th in the ACC in the category where they almost always lead in futility. It appears to be unlikely that the Tigers will push Duke and UNC for the ACC regular season title. But matched against the mass of good-but-not-great teams in the middle of the league, Clemson appears to have a slight – a very slight – edge. No. 4 Florida State (12-2). Leonard Hamilton suffered just one key graduation loss, but point guard Toney Douglas may have been the single most irreplaceable player in the ACC. A year ago, he not only led the ACC in scoring, he was the league’s defensive player of the year. He led FSU in scoring (in fact, he was the Seminoles only double-figure scorer), assists, 3-point shooting and steals. Nobody on this year’s roster has replaced Douglas, but the Seminoles have found partial substitutes in holdovers Derwin Kitchen and Deividas Dulkys and freshman Michael Snaer. FSU might be the most balanced team in the league. Sophomore big man Soloman Alabi, a future NBA lottery pick, leads the team with 12.7 points a game, but seven players average six points or better. Hamilton is loaded down low. Alabi anchors the middle, but gets plenty of help from sophomores Chris Singleton and Xavier Gibson and senior Ryan Reid. The Seminoles lost tough road games at Florida and Ohio State (which was still a top 20 team before losing Evan Turner), but have solid neutral court wins over Marquette and Alabama. They also have an early ACC road win – winning in overtime at Georgia Tech. The ‘Noles block more shots than anybody else in the ACC, but need to protect the ball better – with almost 18 turnovers a game, FSU is by far the sloppiest ballhandling team in the league. That’s got to improve if Hamilton’s team hopes to finish this high in the standings. No. 5 Georgia Tech (10-2) The AP voters have given the Jackets a lot of love. I’m not sure where it’s coming from. Don’t get me wrong. The freshman class that Paul Hewitt was hoping would revive his staggering program (and save his job) is every bit as good as advertised. Derrick Favors, the nation’s No. 1 prospect, hasn’t emerged as a dominant player, but he’s solid – 13 points and 9 rebounds in 27 minutes a game. Point guard Mfon Udofia has been surprising productive, averaging almost 12 points in 28 minutes a game. Wings Brian Oliver and Glen Rice Jr. have been contributors. Throw in veterans Gani Lawal and Zack Peacock up front, along with defensive ace D’Andre Bell back after a year off for injury, and the Jackets ought to be as good as the pollsters think – even with Shumpert on the sidelines. It’s hard to understand why sum of the parts aren’t as good as the individual pieces ought to be. Sure, there’s going to be an adjustment period as the youngsters work their way into the lineup, but is there anybody on the roster who can merge them into a winning team? So far, the team’s body of work is extremely unimpressive. Yeah, there are 10 wins, but which ones matter? A homecourt victory over Southern Cal will look good at tourney time unless the committee remembers that it came before transfer Mike Gerrity became eligible at USC and revived a team that was 4-4 without him. There’s a reason that Georgia Tech is No. 92 (10th in the ACC) in the RPI. The Jackets have lost to the only two decent teams they’ve played – Dayton on a neutral court and FSU at home. There’s still a lot of talent there and maybe it will come together. Maybe the return of Shumpert in the near future will provide a burst of energy. No. 6 Wake Forest (10-2). A year ago, Coach Dino Gaudio had three NBA lottery picks to anchor his team. Now he has one – and sophomore Al-Farouq Aminu has stepped up his game beyond where projected lottery picks Ed Davis and Soloman Alabi have taken theirs. 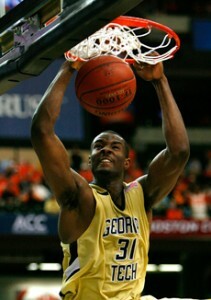 His 17 points and (an ACC best) 11 rebounds a game made the Deacons a team to respect. Senior point guard Ish Smith has also been solid. He’s no Jeff Teague, but the tiny playmaker is one of the quickest players in the ACC and he can get to the basket on anybody. But he’s not a very good outside shooter (15 percent from 3) and after a decent year at the foul line as a junior, he’s reverted to his freshman/sophomore ineptitude, shooting just 34.5 percent from the line. That’s not a good for a point guard who should have the ball in his hands at the end of close games. 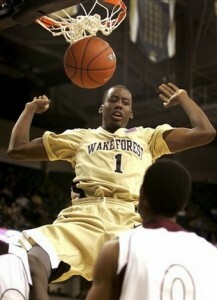 The good news for the Deacons so far has been the surprisingly solid play of unheralded recruit C.J. Harris, a local kid who is leading all ACC freshmen with 12 points a game. He’s provided the 3-point shooting that the Deacs needed so badly, hitting 45 percent on 31 attempts. The team’s best long-range gunner is also a freshman, forward Ari Stewart, who has hit almost 46 percent on 35 attempts. Offsetting the pleasant news is the regression of Gaudio’s big men. Chase McFarland has struggled, while soph Tony Woods, who looked like a budding star at times last season, has failed to bloom (averaging less than 4 ppg. and 4 rpg.). Soph Ty Walker, a celebrated recruit, can’t get off the bench. The Deacons still have a lot to prove. The impressive win at Gonzaga was offset by the dismal home loss to William & Mary. Beating N.C. State at home in the ACC opener is not all that impressive. At the moment, the Deacs look very much like an NCAA bubble team. 7. Miami (13-1). Forget the gaudy record. At least 10 of the Hurricanes’ 12 victims are non-entities. Only a neutral court wins over South Carolina and a home victory over Minnesota amount to anything. Still, you have to admire the way Frank Haith has rebuilt his backcourt after the loss of Jack McClinton, was almost as important to Miami last year as Douglas was to FSU. Freshman Durand Scott and Villanova transfer Malcolm Grant have both had moments of excellence. Scott is a surprisingly mature playmaker averaging an excellent 2.1-to-1 assist/turnover ratio (fourth best in the ACC). In the middle, veteran big man Dwayne Collins is doing what he’s supposed to do – almost 13 points and nine rebounds a game. Haith could use another big man inside (neither Cyrun McGowan, Julius Gamble or 300-pound freshman Reggie Johnson has been all that impressive), but he has some solid wings in veterans James Dews and Adrian Thomas. It will be interesting to see how the ‘Canes young guards and that shaky inside game holds up when Haith’s team starts playing some tougher competition. It doesn’t bode that well that Miami lost its first ACC game to Boston College – although that was a one-point loss in Chestnut Hill, so it’s hardly that embarrassing. 8. Maryland (8-4). If Miami is the most overachieving team in the ACC, there’s no question about the league’s biggest disappointment. The Terps, an early top 20 team, have been about as underachieving as its schedule makes possible. Maryland has played four decent teams and lost to them all. The eight Terp victims make Miami’s unimpressive schedule look like Murderer’s Row. There’s no question where the problem lies. Senior guard Greivis Vasquez, who ranks as one of the ACC’s most talented and most erratic players, has until very recently come down on the erratic side. Although his season numbers – 16 points, six assists and five rebounds a game – look good, when his team has needed him most, he’s been below par. In Maryland’s four losses, Vasquez averaged 19 points, but he shot 36 percent and had more turnovers (19) than assists (17). It’s a shame because Maryland has gotten solid play from veteran guards Eric Hayes and Sean Mosely. Freshmen big men Jordan Williams and James Padgett (especially Williams) have been as good as expected. In the last few years, Gary Williams’ Maryland teams have had the habit of starting slowly then making a late push to get off the NCAA bubble. He was hoping that this team wouldn’t need to follow that path. But it does. Maryland will go as far as Vasquez takes them. He’s bounced back lately, scoring 79 points and passing out 22 assists in Maryland’s last three games. He had two very good games against Winston-Salem State and Florida Atlantic and a less impressive one in the loss to William & Mary. 9. Virginia Tech (11-1). Malcolm Delaney continues to get better and better. But Jeff Allen remains a mystery and Seth Greenberg is still looking for some complementary players. Delaney leads the ACC in scoring (21.5 ppg.) by a wide margin, which is pretty impressive considering that the Hokies play the third-slowest tempo in the league. At least he did lead the league in scoring before he suffered what is reported to be a serious ankle sprain in Wednesday’s victory over Longwood and left the game without scoring a point. Freshman guard Erik Green stepped up against Longwood and the Hokies got double figures from freshman Ben Boggs, who had been invisible going into this game. It’s hard to hell how Delaney’s extended absence would impact Virginia Tech. You’d think, since he was carrying such a large share of the scoring and playmaking role, that the Hokies would flounder without him. But it might have the “Dereck Whittenburg” effect – in 1983, when N.C. State lost its best scorer for more than a month, it forced others to step up and expand their roles, so when he returned in March, the Pack was prepared for its historic postseason run. In the short run, Virginia Tech will probably lose some games that it might have won with Delaney out – but in the long run, the Hokies are likely to be a stronger team when he returns. Watch carefully to see how Green, Dorenzo Hudson and J.T. Thompson step up in his absence. And most of all, keep an eye on Allen – whose scoring and rebounding are down from last year’s solid 14 points and nine rebounds – responds. Can he snap out of his early season funk? At least the Hokies haven’t pulled their usual December trick and lost a couple of games they shouldn’t have – although they had a close call in an OT win over Delaware. The one loss at Temple doesn’t look bad. Wins at Penn State and at Iowa, along with a homecourt win over Georgia, aren’t bad. Several of Greenberg’s teams have overachieved in the ACC after a lackluster preseason schedule. If this team does that, the Hokies will earn an NCAA bid – because for once, they haven’t dug themselves a deep early season hole. 10. 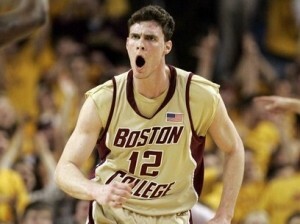 Boston College (9-4). I’m tempted to rank the Eagles higher, especially since they were my preseason choice for No. 3 in the ACC. I’d give them a pass for early season losses to St. Joseph’s and Northern Iowa when Sanders was out, if it weren’t for the more recent losses at home to Harvard (again??) and Rhode Island. The ACC’s smallest team is getting great wing play from sophomore Reggie Jackson, who stepped up his game in Sanders’ absence, and veteran Corey Raji. Joe Trapani is solid, as always – a poor man’s Kyle Singler. And Courtney Dunn is providing Josh Southern will some help in the post. Now that Sanders is back at fullspeed (22 points in Wednesday night’s victory over South Carolina), the Eagles have a lot of firepower. But what’s really hurting BC is the defense – unusual for an Al Sanders team. Right now, BC is the ACC’s worst defensive team, allowing opponents to shoot 42.5 percent from the field and forcing a league-low 11 turnovers a game. That’s got to change if the Eagles are going to move up in the standings. As it stands, BC has dug itself the kind of hole that Virginia Tech often does in the pre-ACC season. It’s going to take a strong conference performance to even put this team on the NCAA bubble. 11. N.C. State (10-3). The Wolfpack has been about as good as any rational N.C. State fan could have hoped. That’s still not good enough to move very far out of the ACC basement. Maybe next year when ACC-quality guards Ryan Harrow and Lorenzo Brown arrive ... as for now, the Pack will ride the strong inside play of junior Tracy Smith and the improving point guard play of Javier Gonzales while youngsters such as Scott Wood, Josh Davis, Richard Howell and DeShawn Painter get a little experience. N.C. State proved at Marquette that is can be a dangerous opponent, but the Pack has not come close to sustaining that level of play. Marquette and a competitive loss at Wake Forest aren’t bad, but there’s also a three-point home win over Elon and home loss to a Northwestern team that was without its best player. The heartbreaking loss at Arizona was not as good as ‘Zona’s reputation would suggest – the Wildcats are pretty mediocre this season. Some State fans noted – with rare perception – that it might have cost them an NIT bit. Better days are ahead in Raleigh, but not this season. 12. Virginia (7-4). New coach Tony Bennett has tried to refute suggestions that he is bringing a slow, ball-control game to Charlottesville. Well, maybe he’ll run when he gets some talent, but right now Virginia is playing the slowest tempo in the ACC (the Cavs and their opponents are averaging 128.7 points a game ... one point less than N.C. State at 129.7 points a game). Sophomore guard Sylvan Landesberg has picked up where he left off last year and is averaging a solid 15.9 ppg. But he’s getting less help than Delaney at Virginia Tech. Virginia doesn’t have another top 20 scorer in the ACC – and no Cavaliers rank among the top 20 in rebounding or in the top 10 in steals, assists or blocked shots. Virginia (like several other ACC teams) has lost to every good team it’s played. Its best victory is probably a neutral court victory over Cleveland State, which is rebuilding after beating Wake Forest in last year’s NCAA opener, or maybe Wednesday night’s easy homecourt win over a decent team from UAB. Bennett worked miracles with the little talent he inherited at Washington State. It will take a miracle to turn this Virginia team to anything other than a last-place ACC team.